Considering the fact that my daughter is has short, blonde hair, pulling this one off was quite the mommy-feat! 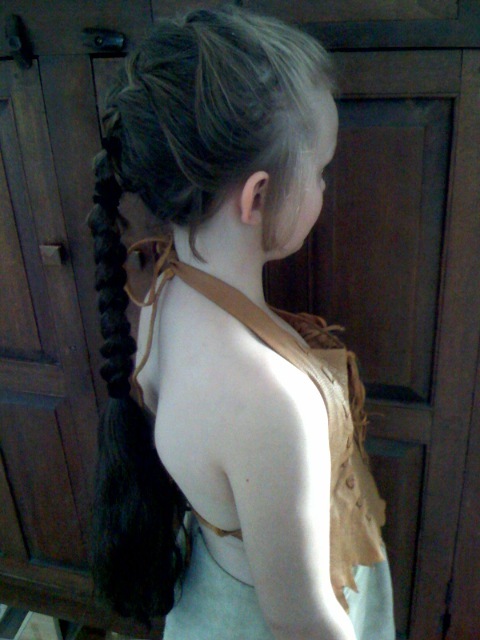 In our favor, her hair is turning dark like my own and the underneath hair was almost the same color as the dark, fake pony-tail that we used to make her appear more like an Indian and less like a blonde-haired, blue eyed little girl. Although she has Native American blood, Alex is quite pale. 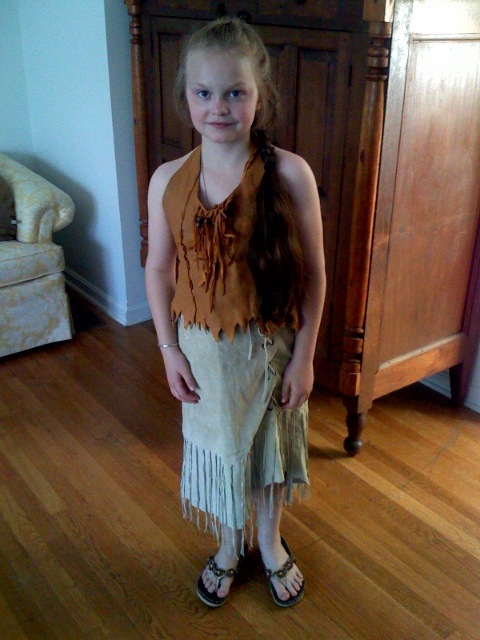 She made an adorable Indian, although the lip-stain that I used for her requested “war paint” was still shadowed on her little cheeks as she trotted off to school this morning. No amount of scrubbing would bring it completely off. We will scrub her again tonight. I took the kids to the Haunted Forest last night, with a group of friends and although she swore that she was old enough for it, Alex still nearly ripped my shirt sleeve off trying to climb up my arm a couple times. Byron and his girlfriend lead the charge (Byron being stoic and Brittney squealing regularly). Daphne and her hubby and stepdaughter were behind us (also squealing). All-in-all, it was a wonderful evening. I even managed to get my new website up for WickedWordCraft before the fun began. And, I found something I’d been seeking for quite some time – a “Wicked Witch of the West” Barbie from the Wizard of OZ collection. I bought it in celebration of Wicked’s fifth birthday and have it right here on my desk. Yeah, I know, I know — but I LIKE it!